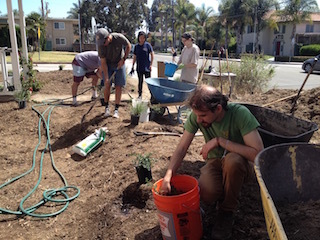 When the Isla Vista Surfrider Chapter was looking to do their first Ocean Friendly Garden, they looked at a city library. 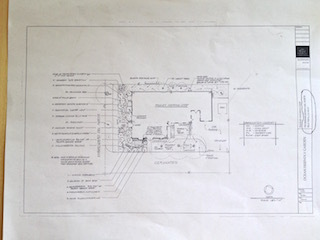 When they ran into requirements to hire a landscape architect to do a design and go through design review, they looked for a more do-able project. They also had to find a project that could be done during a school quarter. 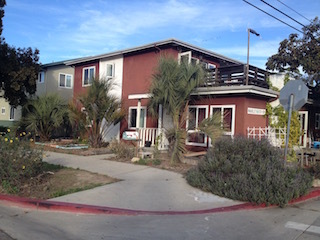 The idea of a student housing cooperative came up, and the Manley Housing Co-op (pictured at right) said "yes!" Chapter OFG Coordinator Josh Inga realized that his OFG Sub-Committee had no landscape expertise, nor project coordination experience. So Josh asked for guidance from Surfrider's National OFG Coordinator. They were connected with the Lisa Holzman-James and Rob Lane, who volunteer in the Santa Barbara Surfrider Chapter's OFG Program. The SB Chapter had done its own OFG project. The Co-op allocated the funds to hire Lisa, a landscape designer, to create the the design. (Lisa got involved in the SB Chapter after attending professional training sponsored by the SB Chapter through a state grant.) Lisa met with students at the site, then created a design. Lisa did the design at a donated cost and put in extra hours on this project. Ester Lee at the Co-op was a key point of contact. The National Coordinator helped them develop a plan, including materials to gather, requesting donations. For instance, Lisa has a good relationship with a local nursery, San Marcos Growers (where SB OFG member, Rob Lane, works), and with the SB Botanic Garden; both donated plants, with the bulk coming from San Marcos Growers. Worm castings were donated by Island Seed & Feed. Tools were made available from Chapters, the National Coordinator, and a friend of the National Coordinator. The work was split into two days, with site prep happening on a Friday and the installation on a Saturday. 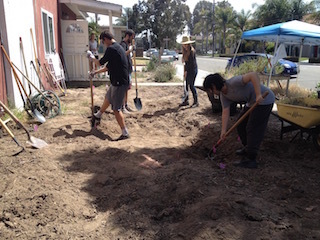 10 people turned out for each day, with about half from both the Co-op and the Surfrider chapters. At the site prep day, the team was saddened to find a degrading layer of synthetic weed barrier, which took time to remove. After that, they got to digging out the swales. 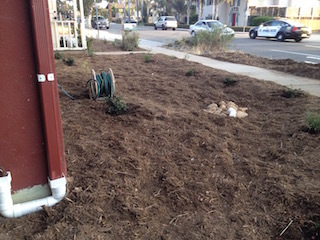 At the installation day was split between sheet mulching, redirecting a major downspout into the front garden area, then planting. Thanks to Rob for helping lead the downspout redirect shown in the picture at right. 2,530 square feet of roof area is directed into landscaping, retaining and filtering 1,568 gallons of water with every 1 inch of rain. The team got the help of 2 Mormons, who were walking the neighborhood as part of their missionary work. The team will re-group in the coming weeks to discuss and create a garden management plan. The plan will focus on watering during the establishment period (and during summer months - for plants that are sensitive to summer watering), adding more mulch, and slightly extending the rest of the downspouts with cobble at their "mouths."